Learn all there is to know about regular expressions today with RegexBuddy's detailed, step by step regular expression tutorial. When you buy RegexBuddy, you get the tutorial both as a help file that you can read on your computer, and as a PDF file that you can print. 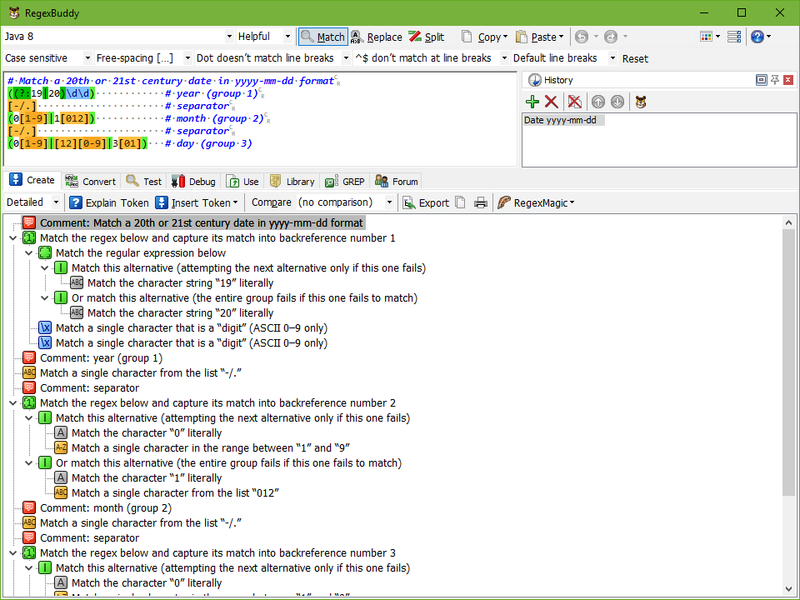 RegexBuddy's regex building blocks make it much easier to define regular expressions. Instead of typing in regex tokens directly, just pick what you want from a descriptive menu. Use RegexBuddy's neatly organized tree of regex tokens to keep track of the pattern you have built so far. When you need to edit a regular expression written by somebody else, or if you are just curious to understand or study a regex you encountered, copy and paste it into RegexBuddy. 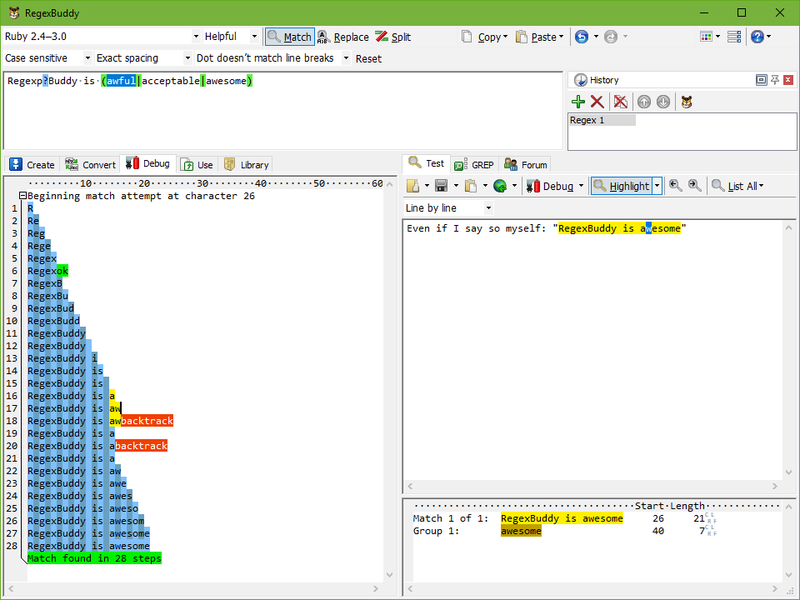 RegexBuddy's regex tree will give you a clear analysis of the regular expression. Click on the regular expression, or on the regex tree, to highlight corresponding parts. Collapse part of the tree to get a good overview of complex regular expressions. Quickly and easily create and edit regular expressions. Mix manipulating RegexBuddy's building blocks and directly editing the regex pattern to suit your own skill and style. Rely on RegexBuddy as you rely on a buddy or coach to assist you. Don't risk actual data with untested regexes. Copy and paste sample data into RegexBuddy, or open test files. Step through the search matches in the sample data, and get a detailed report about each match. Or highlight all matches to debug the regex in real time as you edit it. 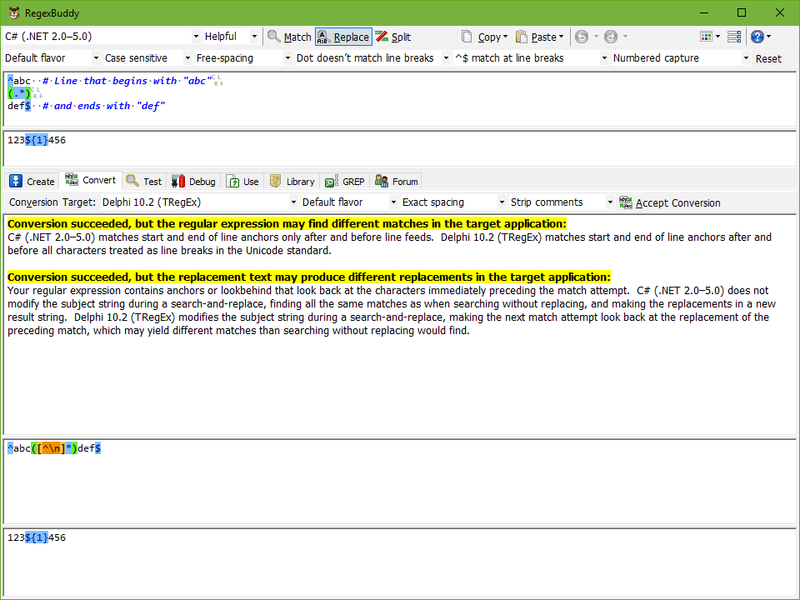 If a regex doesn't do what you want, debug it by looking at the complete matching process, eliminating all guesswork. Compare your regular expressions between any number of all the regular expression flavors that RegexBuddy supports. Make sure your regex works with all the versions of the application you're targeting. Easily learn the differences between your usual regex flavor and a new flavor that you need to use next. Convert a regular expression created for one application to any other application. RegexBuddy automatically substitutes equivalent syntax and warns you about any subtle differences in behavior between the two applications. Never again wonder why a regex that works correctly with one application doesn't work in exactly the same way with another application. Build your own collection of handy regex patterns, and use them whenever you want to. You can easily browse through and instantly search through the regexes you collected. When you found the regex you want, click the Use button. For common tasks, use one of the many regular expressions you can find in RegexBuddy's library of pre-created regular expressions. You will find readily useful regexes for a wide variety of tasks. For many tasks, there will be several choices of regex patterns, with the differences clearly described. Quickly search through files and folders with RegexBuddy's built-in GREP tool. 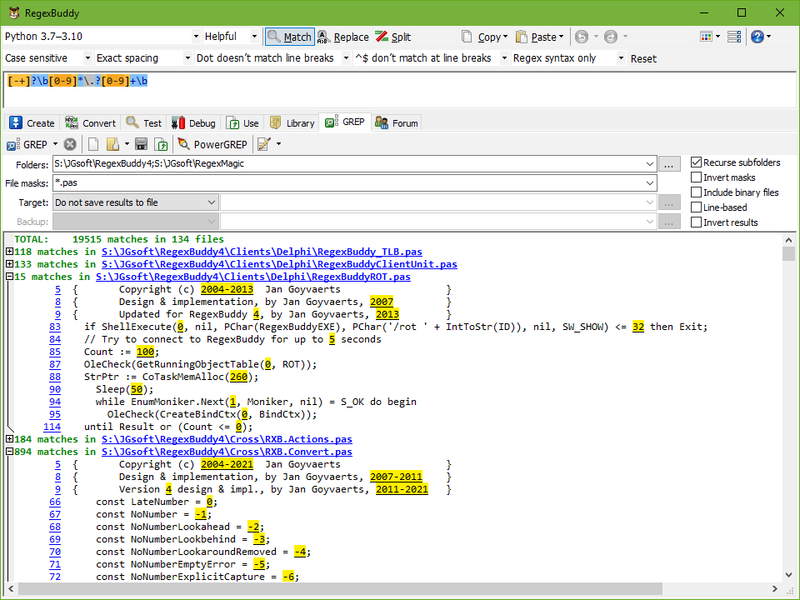 Edit many files at once by searching and replacing with regular expressions. RegexBuddy offers all the functionality you'd expect from a basic GREP tool. Built on the same GREP technology as PowerGREP, RegexBuddy outclasses many stand-alone GREP tools. Integrating RegexBuddy with the software makes your workflow much smoother. 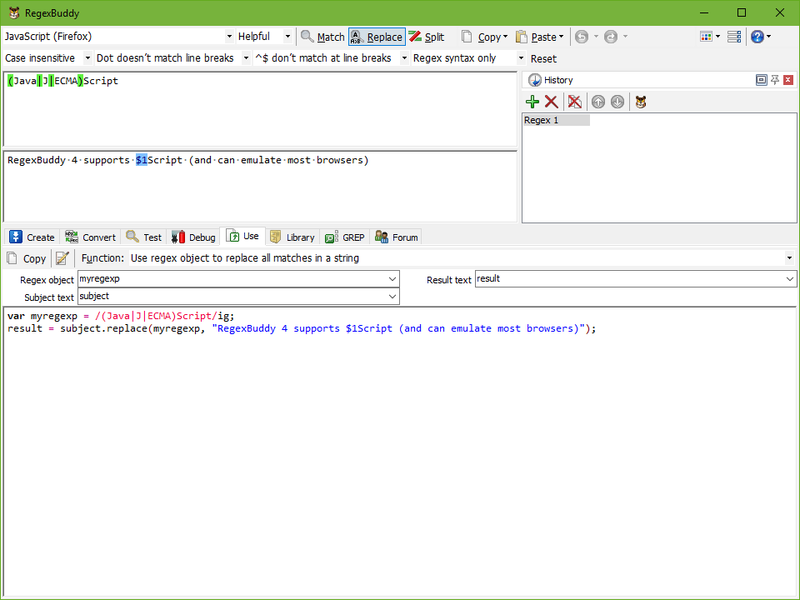 RegexBuddy integrates with many popular applications for working with regular expressions. If your software does not integrate with RegexBuddy, urge its developers to implement this. Any programmer can easily integrate RegexBuddy with his or her software.